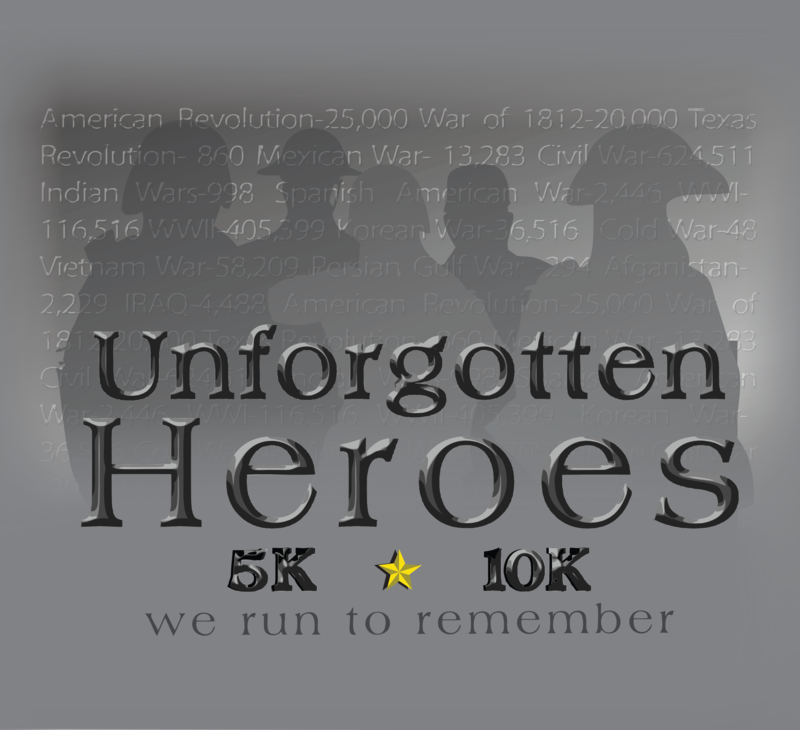 Come out and join us for the 6th Annual Unforgotten Heroes Memorial Day 5K & 10K as we run to remember and honor those who have made the ultimate sacrifice for our freedom. You choose TECH or COTTON shirts! The registration deadline for TECH shirts is May 10! After May 10, only cotton shirts will be available. Shirts are only guaranteed to those pre-registered by May 20. Packet pick up will take place at The Runner in Arlington on Saturday, May 25, from 11 A.M. - 5:30 P.M. and Sunday, May 26 from 1 - 5 P.M. The Runner is located at 3535 W. Pioneer Pkwy, Arlington, TX 76013. Race Day Registration and Packet Pick Up will begin at 6:30 A.M. May 27. *T-shirts and sizes cannot be guaranteed for race day registrations. If you register after Friday, May 24, at 4 P.M., you MUST pick up your packet the morning of the race. The 10K & 5K courses are both USATF certified. The 10K certification number is TX14014LAB. The 5K certification number is TX14013LAB. This event offers a reduced price if you register or join a group of 5 or more. A scenic 10K beginning at Globe Life Park in Arlington and winding through the entertainment district of Arlington. This race is free for ages 10 & younger or 70 & better. It is a scenic 10K beginning at Globe Life Park in Arlington and winding through the entertainment district. If you want a shirt, we ask that you pay $10 to cover the cost. Thank you! A scenic, USATF certified 5K beginning at Globe Life Park in Arlington and winding through the entertainment district. This event is free for ages 10 & younger and 70+. Great for beginners of all ages, or for those running the 5K or 10K who need a warm up. If waking up early on a Saturday just isn't for you, or you can't make it to the run for some reason, but you still want to participate, this is the option for you!